The sun finally came out long enough for us to do an Easter Egg hunt with the horses. The first step was to stash some egg treats around the arena. I didn’t hide these in any way shape or form. 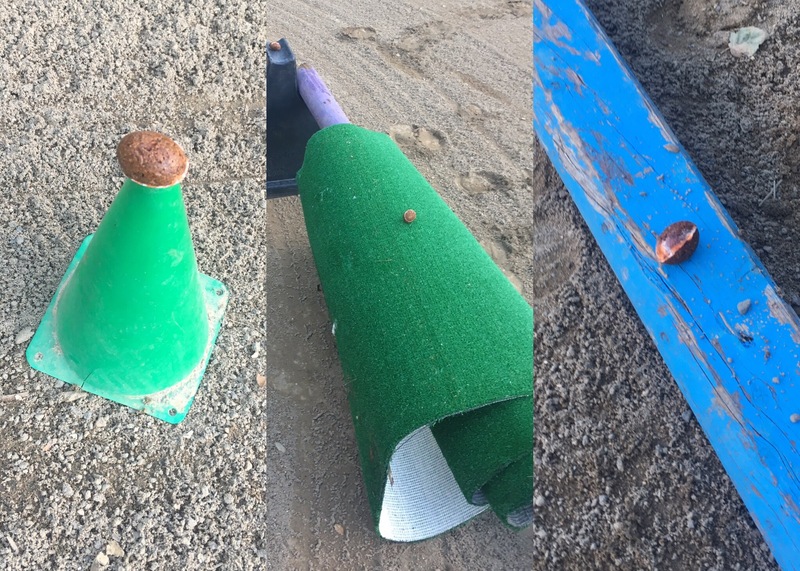 I just placed them on various things in the arena: poles, standards, cones, etc. The next step was to apply bunny ears to the horses. They were thrilled. Then I had to convince the boys to leave the grass and weeds lining the arena long enough to bother looking for treats. I got Eugene to follow me over towards the “hidden” eggs by rustling the bag and then I couldn’t get him to stop following me even when I led him over to a jump with a treat on it. I left Eugene with my husband and went to drag Levi away from the grass. He was happy to follow me without a bribe because he’s essentially a golden retriever in horse form and loves to be with people. But he was sadly also no good at finding treats. 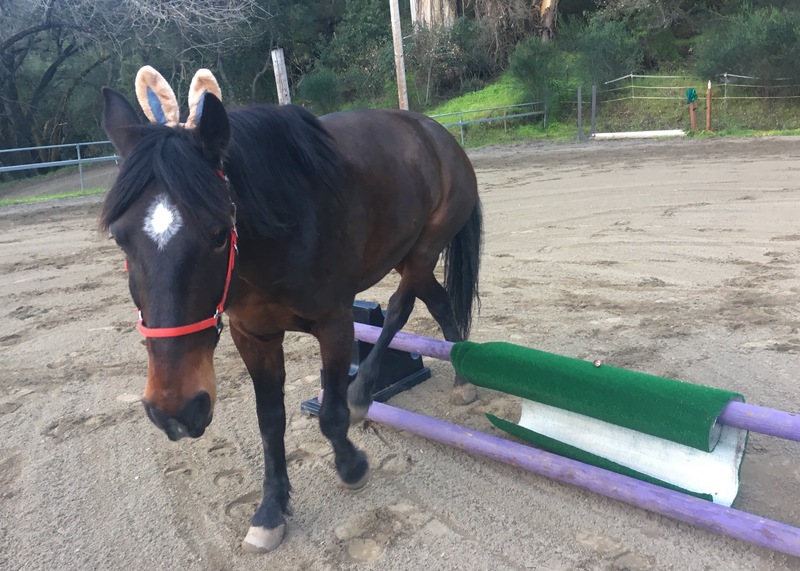 I finally pointed him into finding the one on the blue pole and then he examined the teal pole for a minute without realizing there was a treat on the purple pole. Genius. He eventually found a second egg, spit it out and wandered off to eat grass. Never work with animals or children, people. A treat you say! Where? When he would finally find them, he was happy to eat the treats though. And he followed my husband around begging for more. Eugene did eventually find and eat a few treats. And even if their egg hunting skills weren’t so awesome, they looked adorable in their bunny ears and it we laughed the entire time so it was worth it. Neither Levi or Eugene are terrible food motivated so I never had high hopes for the egg hunt with them, but I figured Nilla would be good for it. 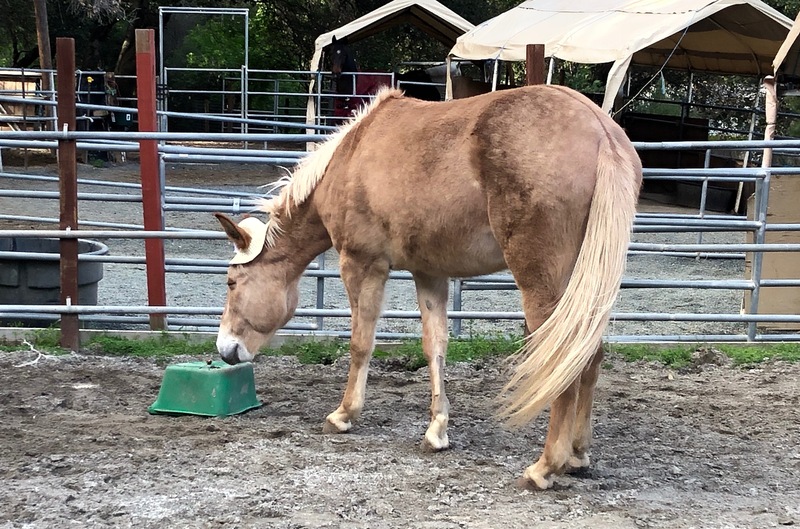 That mule will do anything for food and she’s smart. We didn’t have time that day to do a hunt with her so I had to set up a separate one for her in the small arena. Once again, the treats weren’t really hidden so much as just placed on top of things. Nilla grabbed that first treat as soon as we entered the arena. Then she tried to follow me around because I had the extra treats in my pocket, but as soon as she realized I wasn’t giving her any, she was off on a mission. 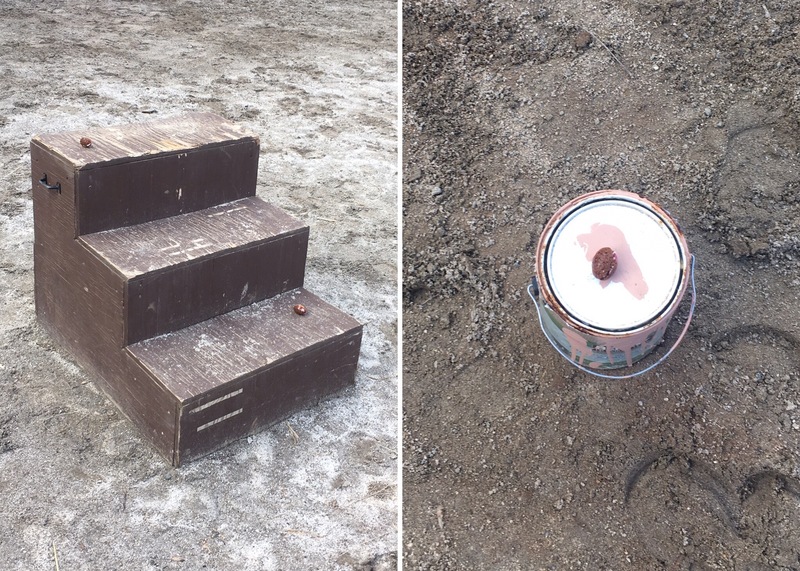 Since it was so easy for her, I tried hiding a treat on the mounting block, but under the bucket. She knew it was there, but didn’t know how to get to it. I had so much fun, I think everyone else should try it to. 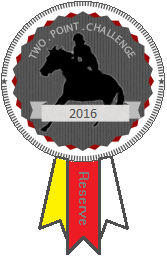 I’m even hosting a contest to get other equestrians to do their own horse treat egg hunt. Stay tuned for contest directions tomorrow! Great photos! Love this. I think Remus might very very good at treat finding but I guess you never know. Adorable! Go Nilla!!! Gem is not food motivated at all and would likely just glare at me the entire time. Nash is insanely food driven and wicked smart, so I think he would play along. I don’t know if my horses would be good at finding Easter eggs but it’s such a great idea I might have to try! Omigosh, the headgear! I thought the bunny ears were cute, but Nilla’s hat is just amazing! This is hilarious and adorable and I think Nilla needs to wear a hat all the time. 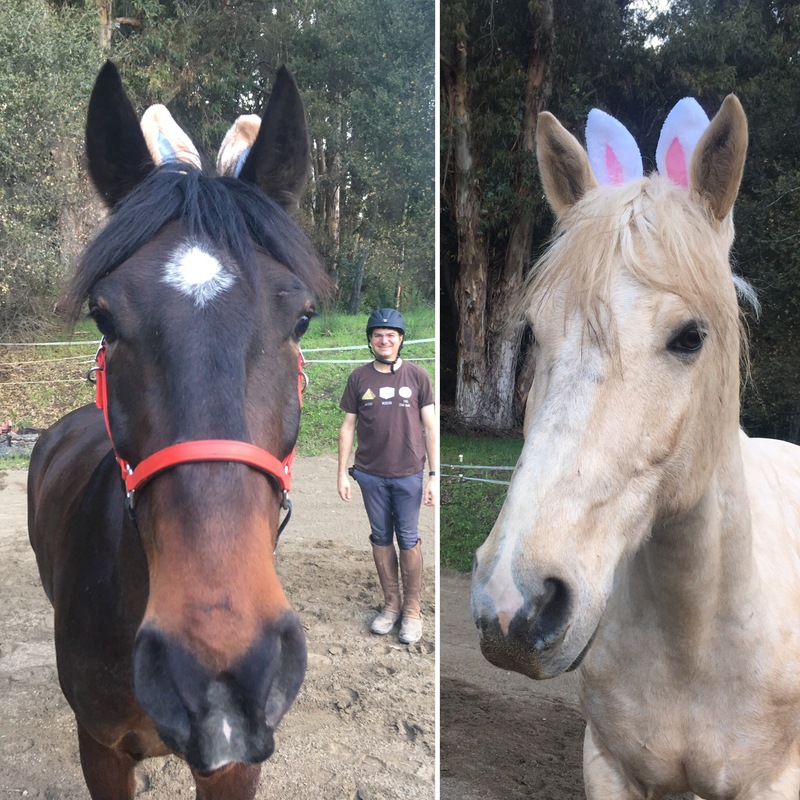 I now need bunny ears for all my horses… bwahahahaha! Oh boy, what fun! Everyone looks ready for the holiday. 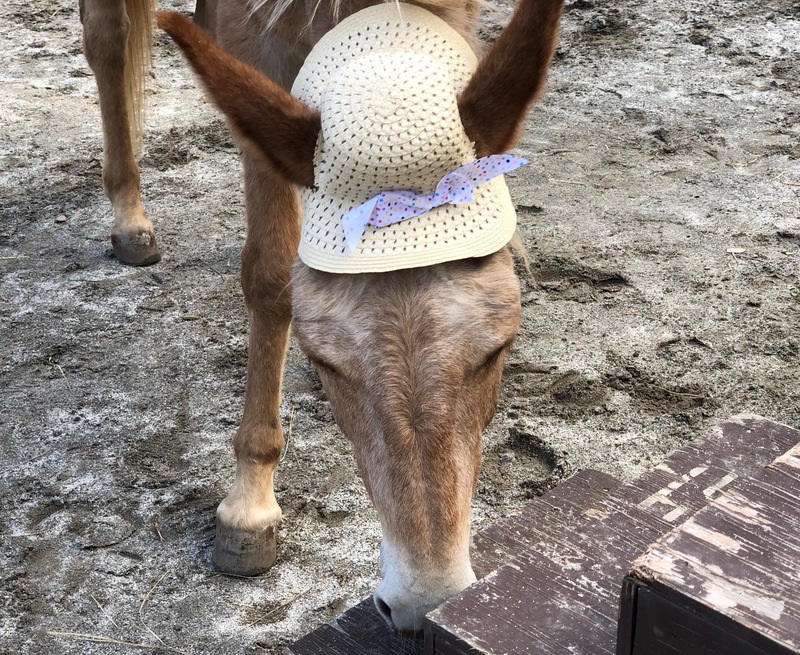 Major already has bunny ears I torment him with, but he might just look amazing in his Sunday best hat! Sadly, I think he is too dumb/unconcerned to look for eggs. But Nilla sure is the smart one in the family! 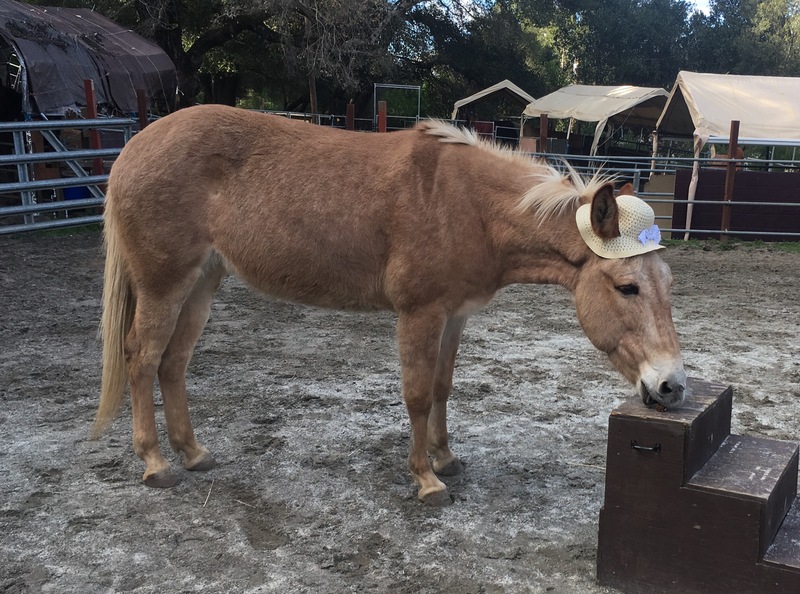 aw this is seriously adorable – i love Nilla in her little hat!!! Me and Val are totally down with an egg hunting contest! This is hilarious! I’m guessing my horse Jamp would be terrible at it, because he’s afraid to leave the first 20 feet of my arena by himself. Rio would do great though. That horse can spot a leaf to eat like 30 miles away. 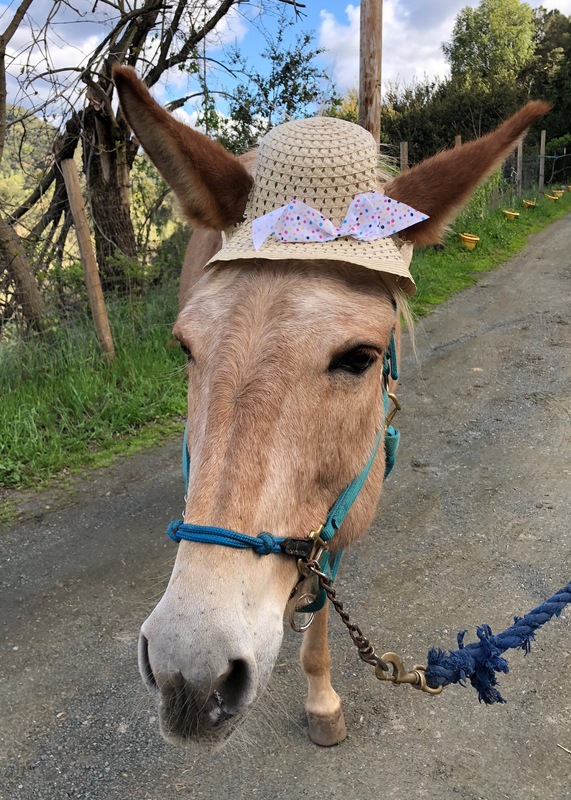 Nilla looks totally fetch in that bonnet! Nilla in that hat is the best thing I’m going to see this week. I have goofy horse headwear and a horse that eats everything. Now I have to start a blog! OMG Nilla killed it in that bonnet. I need a bonnet for my Sam Mule. 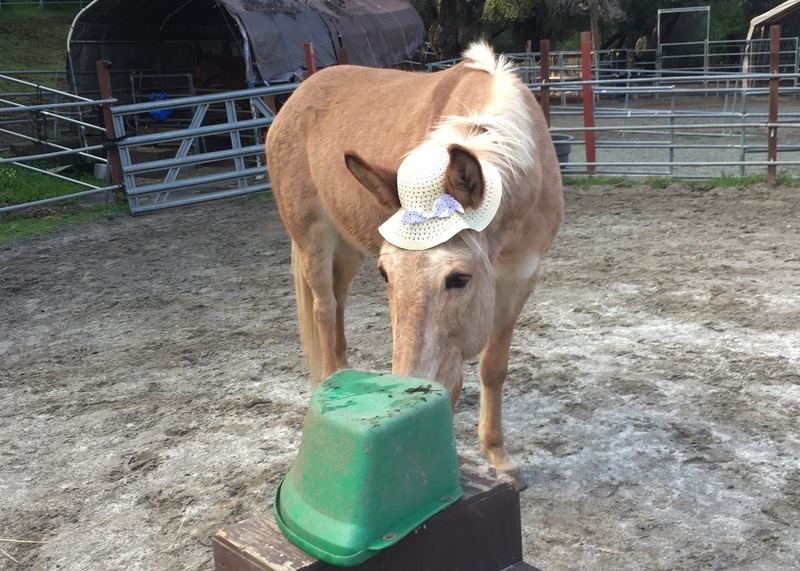 Dammit how do you get a mule bonnet? Are they on Amazon?!? It’s a $1 bonnet from Target. I cut ear holes in.